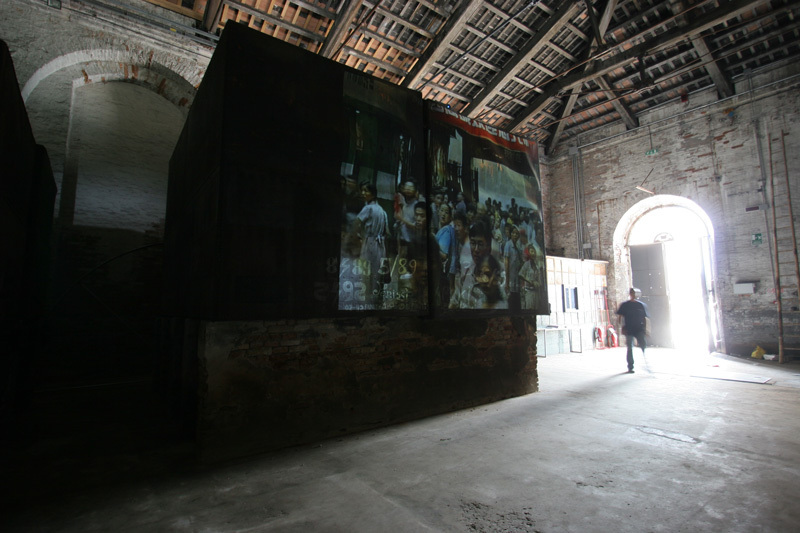 « Michelle McCoy: First of all, congratulations on being in the first China pavilion at the Venice Biennale. You must be very happy Xu Zhen: They should be very happy.I have nothing to be happy about. Michelle McCoy: When and where did you record the shouts in Shout? Xu Zhen: l shot them in 1998. Then this year, 2005, l shot it again to add more. All of the shouts were shot in Shanghai. I shot the footage randomly on crowded streets. The targets were all the people walking on the street, anybody who was on the street. I didn’t know them. They walked on the street in front of me.I followed them. Michelle McCoy: Did they know you were filming? Xu Zhen: No. Michelle McCoy: Are there any particular reactions that stand out in your memory? Xu Zhen: I forgot them all. Michelle McCoy: What was your feeling when you were filming? Xu Zhen: I just carried my camera, followed the people, and then shouted at them. Michelle McCoy: After it became a video, when you saw the documentation of the people’s reactions, what did you think? 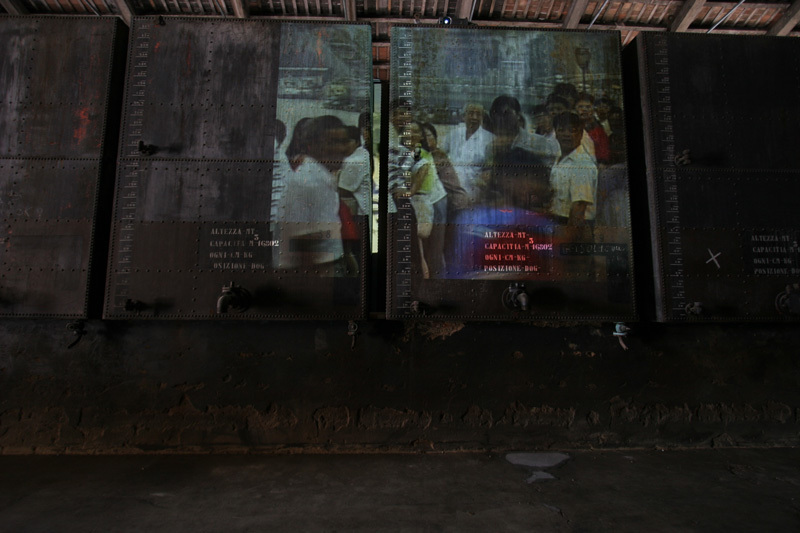 Michelle McCoy: At the Biennale, what do you feel was the viewer’s reaction to you work? Xu Zhen: I don’t care. Michelle McCoy: During the « shouts;’ were you affected by people’s reactions? Xu Zhen: No, I wasn’t. Michelle McCoy: Do you make a distinction between yourself and your work? Xu Zhen: My character and my work are unified. Who I am and what my work is are totally unified. Because I’m a genuine person, my work is genuine. Michelle McCoy: Was there any other artwork that interested you in this year’s Biennale? Xu Zhen: I wasn’t interested in any other artist’s work. Xu Zhen: It’s natural that I don’t like it; there were a lot of exhibitions and a lot of other work. My schedule is full. It didn’t relate to my personal interest. Michelle McCoy: What was the point of going to the Biennale? Xu Zhen: The government made me goes. 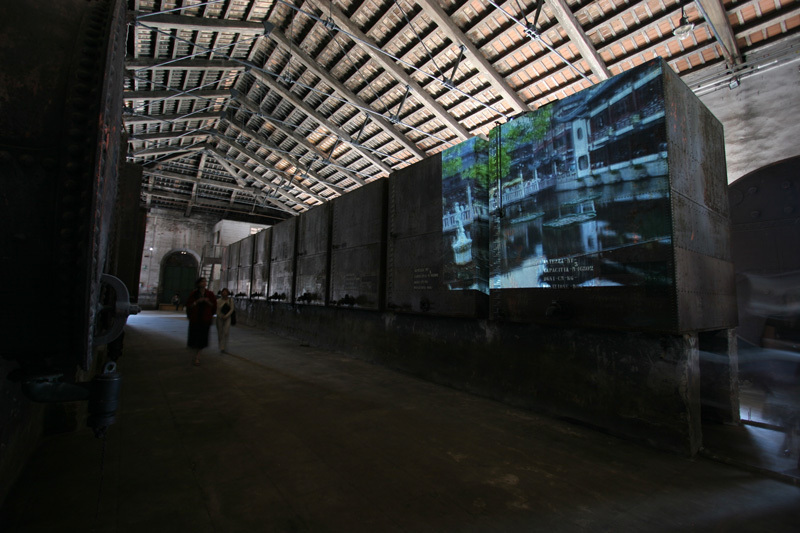 Michelle McCoy: Was this your first time attending the Biennale? What do you think of it? Xu Zhen: It was my second time. I don’t care about having gone to this Biennale. If I have the chance, I go to these art exhibitions, if not, I don’t care at ail, because we always hold our own exhibitions. If I can let more and more people know about my work, it’s a good thing. But, if few people know it, no problem. Even if no one knows your work, it’s still an artwork. Michelle McCoy: What does it mean to China’s young artists that China now has a pavilion? Xu Zhen: I has no idea. That question is really big. Ask the curators yourself. Michelle McCoy: What motivated you to make Shout? Is it meant to be confrontational, like a wake-up call? Xu Zhen: Individualism is the starting point of this work. Michelle McCoy: Did you have any expectations for the way they would react? Were they met? Xu Zhen: It achieved what I expected. Michelle McCoy: In the piece, do you feel there was a degree of separation between you and the people you were shouting at? Do you empathize with them? Do you empathize with your viewers? Xu Zhen: This distance might be what 1 wish to keep. Each of us keeps a distance from others, and it might be one of the ways for affecting the viewer. Michelle McCoy: Why not just go around shouting at people at the Biennale or wherever you are exhibiting? 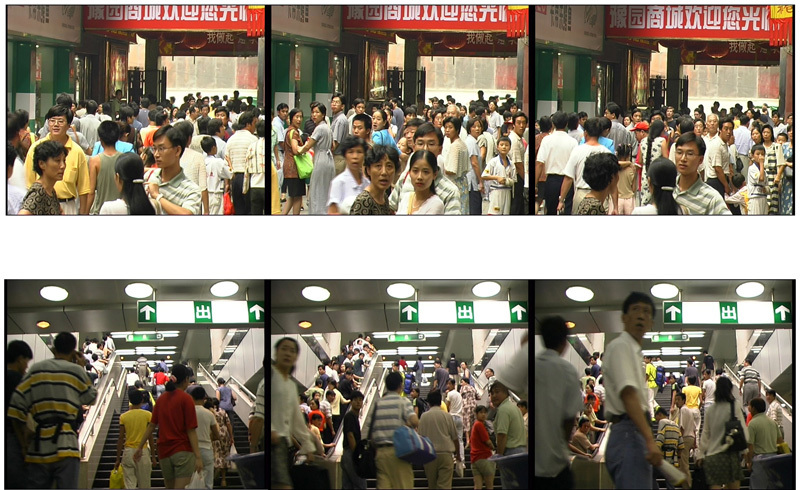 Why videotape people in Shanghai? Xu Zhen: My life is in Shanghai. I record only the Shanghainese. But, still, it can prove the universality of behaviour. Michelle McCoy: Tell me about your work in the 2001 Biennale. How has your work changed since then? Xu Zhen: Rainbow was in the 2001 exhibition. My work is continually evolving. Michelle McCoy: What were some of the differences you noticed between this Biennale and your first one in 2001? Did it feel different to be in the Biennale before there was a China pavilion? How so? 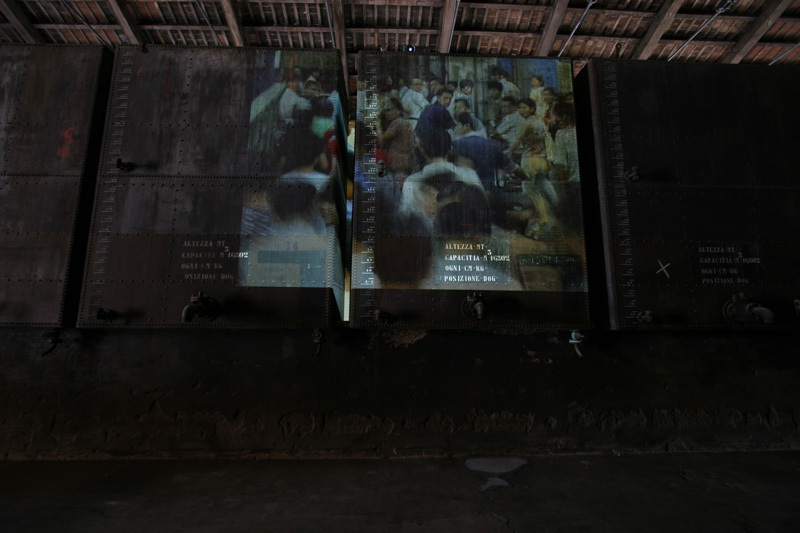 Xu Zhen: Compared with the 2001 exhibition, this Biennale presents more of a mixture of commerce and vacuity. The inaugural China pavilion reveals the changing of contemporary Chinese art. This type of changing has nothing to do with quality. To me, there are only some changes in the weather. Michelle McCoy: Are you friends with the other artists in the pavilion? The curator? How long have you known them? When did you meet? What do you think of their work? Xu Zhen: I know all of them in a basic way.I met them before. The action of our work during this installation of the China Pavilion is to cooperate very well. Everyone is effective in this, but I dislike it. Michelle McCoy: Which artists do you like? How did they influence your work? Do you have any literary influences? Xu Zhen: Many.They affect a subtle influence. Michelle McCoy: Shout warrants a comparison to Vito Acconci and 1970s performance art, or the happenings of Guy Debord and the Situationists International from the 1950s on. What do you think of these comparisons? Do you associate yourself with any movement or generation of artists historically or in the present? Xu Zhen: This type of comparison and imagining is very natural, because history is also one of the materials for creativity. The power of imagination is the weapon for surpassing this type of boundary. Michelle McCoy: What do you think of Shanghai today? Do you aim to influence its development?